The color meter for both color and luminance measures surface colors of products, regardless of whether the product is a solid / solid body or a fluid. 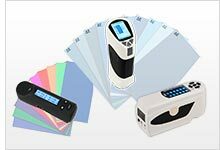 The CR series color meter is included in our range of professional instruments. This color meter can read the difference in color in L d*a*b*, L*C*H* and Delta E*ab according to your requirements. 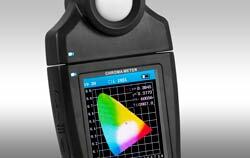 The most popular model of color meter in our range of products is the PCE-RGB. Aside from being easy to use and economical, the color meter is used for determining the location of a color on the XYZ axis of non-radioactive products. The geometry of the measurement of these colors, with luminosity including a field of measurement of 8mm, allows for universal use for all types of materials. Furthermore, these devices are used by artisans, paint manufacturers, architects, painters and designers for testing colors (for color card, NCS, RAL, HKS) or for establishing colors after mixing various colors. For color testing of liquids and pastes, PCE offers an adapter where the color meter PCE-CSM 7 can be fixed easily. So only one instrument can be used to measure colors of all possible solids, powders, liquids and pastes. For information on UV-VIS spectrophotometers, click here. PCE-RGB2 is a color meter for RGB (red, green, blue) or HSL (hue, saturation, luminance) color measurements. 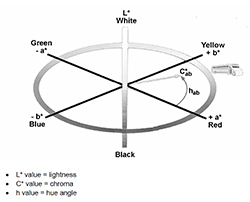 The colorimeter's 45 ° / 0 ° measurement geometry and 16 mm / ≈ 0.63" diameter aperture accommodate standardized color measurement methods on a variety of surfaces. The handheld color-measuring probe is connected to the colorimeter via a 1.5 m / 4.9' long cable, allowing a wide range of motion for the color measurement procedure. The color meter PCE-CSM 1 was developed for quality control and offers a very high accuracy. When using the color meter, you can choose between different color spaces (CIE L*a*b*C*h, CIE L*a*b* and CIE XYZ). After a measurement with the color meter, the reading can be used as a reference value while other readings can be recorded as a sample and later be compared to the 100 reference values easily. 6 mm aperture for sample scanning. The color meter PCE-CSM 3 was developed for quality control and inspection and offers a very high accuracy reading. You can choose between different color spaces (CIE L*a*b*C*h, CIE L*a*b*). After a measurement with the color meter, the reading can be stored as a reference value while other readings can be recorded as a sample and later be compared to the reference value easily. Delta pass/fail indication. This color meter is especially designed for meat, food, vegetables or wet products testing. Only the aperture comes into contact with the surfaces to be measured. So it is guaranteed that no liquids can cause cross contamination while doing the measurement. The color meter simulates to see surfaces like with human eyes. PCE-WSB 1 is a portable handheld battery-powered brightness / whiteness color meter used to measure the brightness level of paper, cardboard, cellulose, pulp, textiles, paint, enamel, plastic, porcelain, cement, concrete, building materials, chemicals, powders, talc, starch, flour, salt, detergents, cosmetics and other non-metal substances. The color meter PCE-CSM 6 was developed for quality control and offers a high accuracy. When using the color meter, you can choose between different color spaces (CIE L*a*b, CIE L*a*b*C*h). After a measurement with the color meter, the reading can be used as a reference value while other readings can be recorded as a sample and later be compared to the reference value easily. Useful for determining color difference, chromaticity index, color sample database management, and color difference cumulative analysis. PCE-CRM 40 is a portable handheld color meter or spectrophotometer used to accurately measure the correlated color temperature (CCT - in Kelvin), illuminance, chromaticity, excitation purity (Pe), luminous flux (in lumens - lm), RGB and dominant wavelength of light sources such as LED, organic LED (OLED) and other forms of organic electroluminescence (EL). The color meter PCE-CSM 5 was developed for quality control and offers a high accuracy. When using the color meter, you can choose between different color spaces (CIE LAB, XYZ, LCh, RGB, LUV). 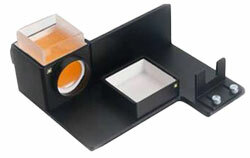 In addition, the color meter PCE-CSM 5 comes with two different measuring apertures (Ø6 mm and Ø10 mm). PCE-CSM 7 is a portable color meter used to measure different spectral parameters. This user-friendly, ergonomically designed color meter automatically performs a white and black calibration when powered on. Suitable for manufacturing quality control as well as product research and development, the color meter offers impressive measuring accuracy and comes manufacturer calibrated. Camera/illumination locating for small samples. The PCE-TCR 200 color measurement device carries out an analysis of the color using CIE L*a*b color space. This color meter also allows you to determine the colors in the RGB color range. The test instrument is mainly made for use in plating and painting industries. It has three inspection conditions: D65 (daylight), D50, and F11. Also this color meter comes manufacturer calibrated. The color meter and spectrophotometer PCE-CSM 8 was developed for quality control, offers a high accuracy and comes with a 3.5" touch screen display. When using the color meter, you can choose between different color spaces (CIE LAB, XYZ, Yxy, LCh, LUV, HunterLAB). The reading can be used as a reference value while other readings can be recorded as a sample and later be compared to the reference value easily to determine delta pass/fail. PCE-CSM 20 is a handheld spectrophotometer color meter used for high-quality color measurement. Featuring a single 8 mm aperture and including SCI and SCE specular modes for industrial color measuring applications, the PCE-CSM 20 offers a long battery life, 4-color lamp and an easy-to-use portable design. The PCE-CSM 20 covers the full spectrum from 400 to 700 nm in 10 nm increments. Camera/illumination locating for small samples. PCE-CSM 21 is a handheld spectrophotometer color meter used for high-quality color measurement. Featuring a custom 4 mm aperture and including SCI and SCE specular modes for industrial color measuring applications, the PCE-CSM 21 offers a long battery life, a 9-color lamp and an easy-to-use portable design. The PCE-CSM 21 covers the full spectrum from 400 to 700 nm in 10 nm increments. Camera/illumination locating for small samples. The color meter PCE-CSM 10 was developed for quality control, offers a high accuracy and comes with a 3.5" touch screen display. You can choose between different color spaces like CIE L*A*B, XYZ, Yxy, LCh, LUV, LCH, LAB &WI &YI, Color Fastness, and Staining Fastness. 400 to 700 nm photodiode array for 10nm wavelength increments with Reflectance Curve graph. PCE-CSM 22 is a handheld spectrophotometer color meter used for high-quality color measurement. Featuring a dual aperture 8 mm and 4 mm, and including SCI and SCE specular modes for industrial color measuring applications, the PCE-CSM 22 offers a long battery life, a 18-color lamp with UV light, and an easy-to-use portable design. The PCE-CSM 22 covers the full spectrum from 400 to 700 nm in 10 nm increments. Camera/illumination locating for small samples. PCE-CSM 22 is a handheld spectrophotometer used for high-quality color measurement. Featuring a dual aperture 8 mm and 4 mm, and including SCI and SCE specular modes for industrial color measuring applications, the PCE-CSM 22 offers a long battery life, a 8-color lamp with UV light, and an easy-to-use portable design. The PCE-CSM 22 covers the full spectrum from 400 to 700 nm in 10 nm increments. Camera/illumination locating for small samples. The LED Color Meter MK350S is applied to measure LEDs. The LED color meter performs a spectral analysis on light, which is emitted by LEDs. The MK350S LED color meter measures besides the color spectrum also the illumination level in Lux, the color temperature and many other parameters, that are used for the selection of LEDs. The color Meter Spektromaster 565-45 is especially suitable for quality checks of many devices. The color Meter has the main advantage of being able to measure color and gloss at the same time. 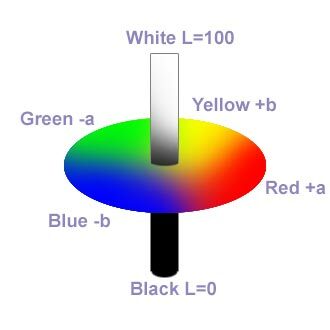 Color meter works according to the tristimulus absorption and imitates human vision. 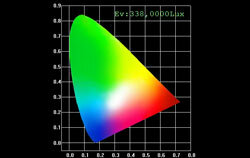 In the human eye the three basic colors red, green and blue are recorded over three different cone types, color meter imitates this color perception by means of 3 color sensors with almost identical spectral sensitivity in the areas of red, green and blue. The color values determined in this way are represented as X, Y and Z values on the display by the measuring devices, the conversion into common color spaces such as CIELab or RGB is carried out by most devices automatically. Though spectrometer works according to the identical basic principle, the significant difference to color meter is sensitivity and the number of sensors. Depending on the quality of the device, spectrometers are equipped with significantly more sensors so that the devices have a wavelength-specific sensitivity in a single-digit nanometer range. Thus, not only color coordinates can be determined, but also the spectral distribution and intensity can be determined and represented much more precisely. 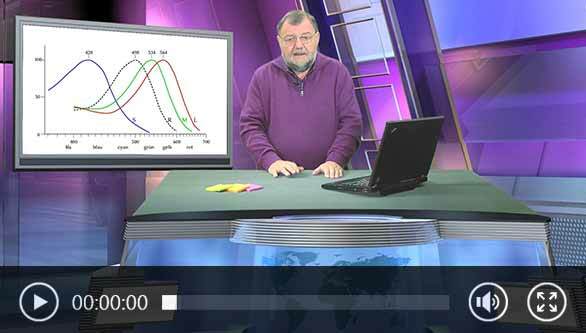 Spectrometer can also detect metamerism. In case of this phenomenon, for example, two different objects under a certain light source appear to be of the same color, but under a different light source a distinct color difference is visible and evident. The reason for this is that usually different spectral reflection properties of the surfaces are caused by the use of different pigments. For this reason, spectrometers are preferably used in research and development as well as in cases when colors and color spectra have to be determined very precisely. For the use in the production process, the goods receipt and output control, as well as in quality control, the color comparison measurements with the simple representation of color differences and deltaE values by means of color meters are generally sufficient. The measurement geometry describes the alignment between the emitting light source of the measuring device and the surface of the object to be measured as well as the alignment of the sensor to the reflecting surface of the object to be measured. The choice of the correct or incorrect measurement geometry can have a considerable effect on the measurement results and lead to interpretational errors during the information exchange between customers and / or suppliers. Since the measurement geometry cannot be changed or adjusted afterwards, clarity should be provided before the purchase. Known geometries are d / 8 and 45/0. The d / 8 measurement geometry produces diffuse light, thereby the effect of the surface texture in terms of gloss and roughness is reduced. With this geometry, one can, so to say, look inside the color. Partially, measuring instruments with this geometry also have optical shines (SCI) (SCI) in order to allow the gloss effect influence the measurement or not. In contrast, the 45 / 0 measurement geometry produces a directed reflection which corresponds more to human perception. Therefore, it makes sense to use the 45 / 0 geometry, when the visual impression an object has on humans should be adjusted. When selecting the accuracy requirements, attention should be paid to the reproducibility of the measurement results as well as the comparability of different measuring instruments of one series. Particularly in case of spectrometers, a spectral resolution of the measuring devices must also be taken into account. Internal inspection or external requirements? An important point, which must be clarified before the purchase of a color measuring device, refers to the present reference values. Does it go about company's internal measurements, during which the process reliability and quality are to be checked based on specially defined color values? Or should the external requirements of customers or suppliers be taken into account? If external requirements are decisive, a preliminary clarification between the parties, concerning which measuring instruments are to be used, is required. It is particularly important to achieve an agreement about measurement parameters (color space, measurement geometry, measuring aperture, light type, SCI, SCE, Spin, Spex); otherwise the comparability of the measurement values is not possible. Ideally, both parties use identical measuring devices from one manufacturer. Color space or color cards? 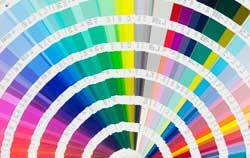 Many comparative measurements take the color values from standard color systems or color catalogs into account. Known color catalogs are e.g. RAL, NCS, DIN or Pantone. Based on these catalogs, visual inspections can be carried out during the production process and quality control. The visual comparison of color cards with printing inks, coloring or colored coatings is, however, faulty, since it is often impossible to check it objectively under the same conditions. Reproducibility and objectivity can be provided by the color meter, since under defined conditions digitally stored color catalogs can be matched with the customer color patterns. 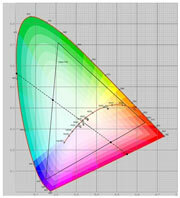 In addition to color cards, often also color spaces like the CIELab or RGB color space are used to determine colors. The color spaces are geometrically defined, three-dimensional bodies, in which each color is characterized by 3 coordinates in the X, Y and Z directions. By specifying the spatial coordinates of the corresponding color space, the colors can be exactly determined and the color spacing can be precisely estimated. Since color spaces, in contrast to color catalogs, can represent all perceptible colors and are used not only in a few industries and, therefore, are universally applicable, the use of color spaces is often more comparable and independent. The use of different light types can change the perception of color impressions. The CIE has therefore established standard illuminants with a defined spectral emission in order to create comparability. The choice of the applied type of light had to be oriented to the later application of the product. The widely spread standard light type is D65. D65 simulates the daylight with UV components at a color temperature of about 6500 Kelvin. The standard light type C also stands for daylight, but without UV components at a color temperature of about 6770 Kelvin. The light type F11 or TL84 is also referred to as department store light at 4000 Kelvin and is suitable when the products are kept under artificial light. In addition to these light types, there are many others from narrow- to broadband standard light types. Depending on the application, a suitable design is also to be selected in the sense of ergonomics. In some devices, the display is placed on the top, while in the other color meters the data is read from the front side and the sensor system is internally installed in a housing. Besides, there are also measuring instruments with external sensors. In addition, some measuring instruments have built-in cameras to assist in the positioning of the measuring device on the object to be measured. Particularly for small objects and small apertures, this function helps to choose the correct positioning of the device, and thus, “hit” the measuring point. Can smooth, flat and solid surfaces be measured? Does it go about liquids or should the color of fine powders be determined? Are they coarse granules or viscous pastes? There are solutions for all applications. If the surfaces are not smooth, hardened, then mostly special devices with partially transparent cuvettes are required. In these cuvettes, the materials of different consistencies can be measured and tested. The different colors of the color space become classified by a color space system. A color space system is a coordinate system in which each color is sorted by coordinates on different axes. Caused by the structure of the human eye, the color space works with three axes. There are about thirty color space systems. One of the main used is CieLab. The CIE Lab system is a color space, which was established by the International Commission on Illumination CIE in the year 1976. It was developed from the CIE color system and is based on the presented CIE standard colorimetric system in 1931. Color differences are to be determined numerically using the device-independent color 3D model. The model is objective and is the closest to human eyes. A major problem in the development of color meters is to deliver measurememnt results that are felt in the same way as the color impressions given by the human eye. The problem of the color space is the disagreement with the color perception of humans. For ink mixtures, there especially is perception problem in the yellow area. On the other hand the human eye can be cheated in color-mixing by adding a higher proportion of a blue. The mixture shows up more white / bright. It is the phaenomena of optical whitening. To eliminate this problem often color meters are used. For example, in the production of semi-finished products. Comparison problem: Semi-finished products are measured with color meter A and sent out to a processor company which produces the end product. In the processors company the incoming products are measured by color meter B. The result is different to the data measured with the meter A. That means the color meters used in the production chain should be from the same type, adjusted and calibrated in the same laboratory to reach nearly the same measurement results. So complaints can be avoided in the most of the cases. It is not an ideal solution, but both parties can talk about precisely defined differences in chromaticity, because they have set the color space before and use in the same color meters. The CIE L*C*h or CIELCh color scale is an approximately uniform scale with a polar color space. The CIELCh scale values are calculated from the CIELAB scale values. The L* value (lightness) is the same in each scale. The C* value (chroma) and the h value (hue angle) are calculated from the a* and b* values of the CIELAB scale. At right is a diagram of the CIELCh color space.